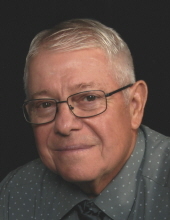 Herman C. Wonderly, 77, of Fostoria, passed away at 9:30 pm Saturday March 30, 2019 at Hospice of NW Ohio, Perrysburg. He was born March 23, 1942 in New Riegel to the late Richard and Marjorie (Turner) Wonderly. He married Arnetta M. Koons on July 6, 1963 at St. Wendelin Catholic Church and she died October 4, 2012. Surviving are three daughters, Angela (Patrick) Noel, Catherine Sampson and Monica (Ron) Radcliff all of Fostoria; two grandchildren, Ben Noel, Bowling Green and Michael Noel, Tiffin; two brothers, Thomas (Linda) Wonderly, Fostoria and Anthony (Sharon) Wonderly, Fremont. He was also preceded in death by a granddaughter, Morgan Rae Radcliff; sister, Theresa Weber; brother, Bernard Wonderly; and infant brothers and sisters, Mary Ann, Ignatius, Mark and Ann Wonderly. Herman was a 49 year journeyman tool and die maker, retiring from Honeywell in 2011. He also had worked at Hayes Albion, Tiffin, Grabler Foundry and Wonderly Brothers Construction, Fostoria. He was a member of St. Wendelin Catholic Church and a 3rd degree honorary life member of Knights of Columbus council #1197, Fostoria. He was a member of the Catholic Order of Foresters and was a gold rosary recipient. He attended New Riegel School until 1959 and graduated from Fostoria High School in 1961 and later attended Terra Technical School. Herman was an extraordinarily kind and generous man who loved spending time with his family and friends and would usually be found at home working in his barns or workshop. He gardened, raised bees, attended to his fruit trees, made apple cider and enjoyed going to flea markets. Herman was an extremely gifted jack of all trades. So many local businesses and members of our community have been fortunate to have him fix items, create solutions for problems or just be there with an extra set of hands to help. Visitation is Wednesday April 3, 2019 from 2-5 & 6-8 pm at HOENING & SON FUNERAL HOME 133 W. Tiffin St., Fostoria where a Christian Wake service will take place at 7:30 pm. Funeral Mass is 10:30 am Thursday at St. Wendelin’s with Rev. Todd Dominique presiding. Burial will follow in St. Wendelin Cemetery. A luncheon will then be served in St. Wendelin Parish Hall. Memorials are suggested to Hospice of NW Ohio, Perrysburg, Taussing Cancer Center of the Cleveland Clinic or St. Wendelin Church. To send flowers or a remembrance gift to the family of Herman C. Wonderly, please visit our Tribute Store. "Email Address" would like to share the life celebration of Herman C. Wonderly. Click on the "link" to go to share a favorite memory or leave a condolence message for the family.